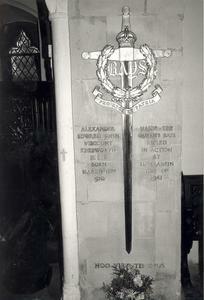 Tablets on wall of church with a crest of the Queen's Bays and a vertical sword. Raised lettering. PRO REGE ET PATRIA/ ALEXANDER/ EDWARD JOHN/ VISCOUNT/ KNEBWORTH/ M.B.E./ BORN/ MARCH 10TH/ 1910/ MAJOR THE/ QUEEN'S BAYS/ KILLED/ IN ACTION/ AT/ EL ALAMEIN/ JULY 4TH/ 1942/ HOC VIRTUTIS OPUS.